Upstate residents will soon have a new place to learn about environmental stewardship and get science education. Greenville County Schools is planning to construct a $14 million facility at the Roper Mountain Science Center. This facility will provide environmental education and sustainability. The new building will provide students and visitors an immersive education as well as the opportunity to foster exploration and stewardship of natural resources. There will be hands-on leaving and encouragement for committing to create solutions to combat human interaction with the natural environment. Work is underway and construction will begin this spring or summer. Tentative open scheduled for fall of 2020. 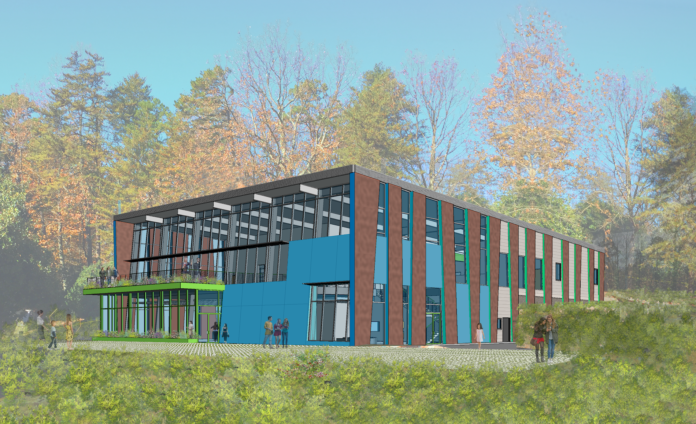 This new two-story building will have about 28,000 sf of interior space and located on a 5-acre parcel of land next to the Harrison Hall of Natural Sciences. It will have flexible teaching spaces, open-concept exhibits and a lot of new amenities that they haven’t been able to provide to visitors before. Three in-depth learning classroom/labs, pledge wall and lobby are included on the top floor. And the history of Roper Mountain will be shared in a 1,200-sf orientation space with digital interactive upstate map and a habitat overview. A 2,200 sf “Sustainable Future” museum exhibit will feature interconnected stations to highlight how decisions about energy, food, water, waste, transportation and clothing will affect our community’s future and the world. Each station will challenge students and visitors to measure their impact on the environment with graphic panels, action lists and local organization stories. The ground floor will include a dining space with room for 200 seats and four classrooms. Also included is a 2,000-sf exhibit called “Water Story” that highlights the importance of the Greenville Watershed and the water cycle processes. This “Water Story” will include graphics and models depicting plants and animals living within the watershed environment. The design process has included input from several Upstate businesses and organizations. Each of the museum exhibits will highlight how partner businesses and organizations work to help the environment. Roper Mountain Science Center is also working with the David E. Shi Center for Sustainability at Furman University to incorporate new learning methods and techniques into brand new lesson plans that will be made available in the new facility. Due to capacity restraints, Roper Mountain’s natural science programs focused on elementary grade children. The new facility will allow them to expand and provide lessons and labs for middle-schoolers as well as expand the elementary programs. Students served will increase another 20,000 a year. Projections show the facility costing around $14 million to complete. Ten million will be provided by the Greenville County School District’s Long-Range Facilities Plan and Capital Improvement program. Roper mountain is planning to start a fundraising campaign to gain the additional $4 million needed.